The game came out in 1984 for the Apple II and the Commodore 64, but this ad is from 1985 which also saw a port for the Atari ST. It’s a great ad that captured the spirit of game in a fantastic illustration as our hero struggles to save the Gemstone. And screenshots! 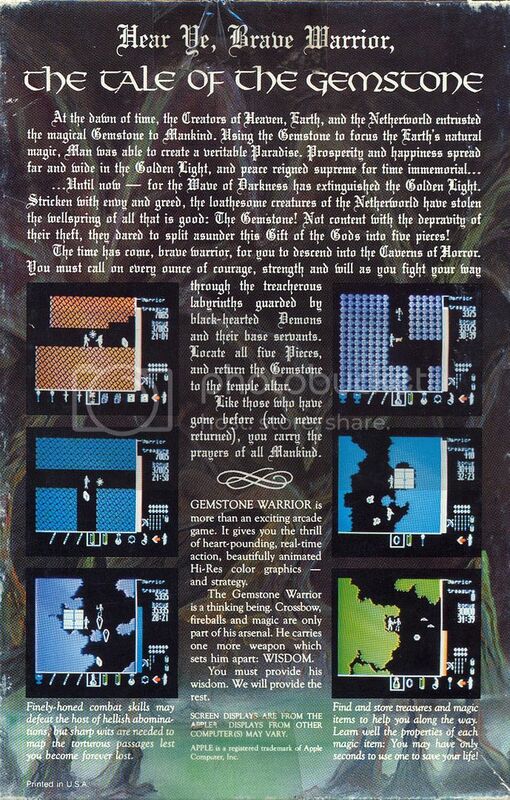 Before SSI’s partnership with TSR contributed to some of the best looking CRPG ads from any company, they had a respectable stable of their own dungeons like the ones in Gemstone Warrior. 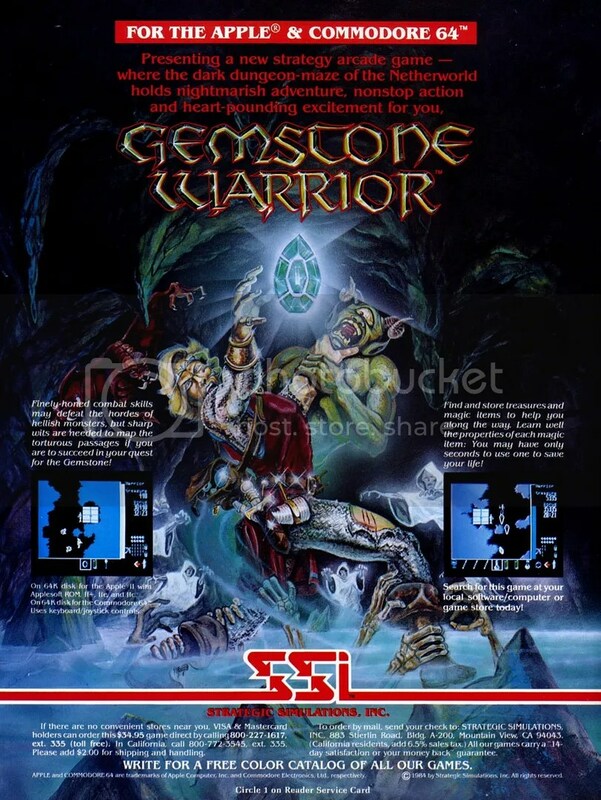 Released in 1984 and developed by Paradigm Creators, Gemstone Warrior was an early action adventure wrapped up in high fantasy. It was initially released for the Apple II and the Commodore 64, but later find itself ported to a wide variety of platforms like the Macintosh, FM-7, and the PC-98. The story, laid out as a mythic story of creation and struggle in the manual, tells of how the gods created the world and gifted Mankind with the Gemstone. The Gemstone focused the natural energies of the Earth into powerful magic enabling humanity to prosper. But the Demons grew jealous and schemed of ways to destroy their golden age only to be beaten back into the shadows by the power of the Gemstone. Marshaling their forces beneath the volcano they created to reach the surface, they burst forth slaying all in their way and seized the fabled relic. But they couldn’t use it. It was made only for human hands. In a rage, the Demons found they could only shatter the Gemstone into five pieces and these they hid within a terrible dungeon called the Maze. Yet they had accomplished what they set out to do. Without the Gemstone, humanity quickly began its descent into chaos as brother became divided against brother in a post-apocalyptic struggle for survival. Whatever magic relics were left were used to fight each other instead of the Demons and their minions. Those who went into the volcano in the hopes of retrieving the pieces of the Gemstone, as few as they were, never returned. That’s where the player comes in. The back of the box laid out everything about the game and provided plenty of screenshots regardless of what port was in the box. The screens used here were from the Apple II version which — like many games back in those days — were played off of a single 5.25″ floppy disk. All that game on one square piece of plastic. Gemstone Warrior is a tough game. Even on the so-called “Beginner” level, it’s easy to get lost in the caverns beneath the volcano — and that’s without even getting to the actual Maze where the pieces of the Gemstone are hidden away. A joystick was also recommended for play and it also allowed the player the option to remap keyboard commands. Players could also save their game anywhere. Gameplay consists of a big screen showing the immediate area around our armored avatar as players move him up, down, left, right, and wherever else they can in getting through the tunnels, massive rooms, and through the hordes of beasts in the way to the next door. Or doors. Sometimes a room can consist of only a tunnel with a door on either side. Sometimes it can be a huge cavern with several to pick from. Making your own maps was virtually a requirement to avoid getting lost, especially after finding all of the pieces to the Gemstone. An onscreen inventory also tracks loot snagged from chests, coffins, and the bodies of dead beasties slain by your crossbow. In a way, Gemstone Warrior is a kind of 2D shooter though not quite a pure arcade game. Players can pause the action to get a better gauge of enemies onscreen, for example, and stuff found along the way consist of valuable healing items, magic crystal balls that act as area killing specials that might be more at home in a shmup, and oddities like a 5.25″ disk listed as an ‘Ancient Black Thing’ with an equally obscure purpose in-game. ‘Magic bolts’ can also be stockpiled for those sticky moments for when you just need things to die quickly. Crossbow quills are also limited and they’re the one weapon that you’ll be using the most of throughout the game. At the higher difficulty levels like ‘Normal’ and ‘Kamikaze’, monsters will have a few new tricks up their sleeves and will also mess with item effects. The manual lays out what each item can do, but that only applies to the ‘Beginner’ setting. They get jumbled in the other settings, adding to the challenge as you experiment with what you can find while hoping that you don’t die from quaffing what may have been a healing goblet from before. Exploding gas plants, disease spreading shamblers, skeletons, reproducing amoeba, and ghosts round out most of what the player will be shooting at. The Demons that come out to play later on once all of the Gemstone pieces are found, however, will be the worst enemies. Other than rare magic bolts, crossbow bolts hardly do any damage to them and they’re relentless in chasing the player down. It literally becomes a race to the exit, not only to escape alive, but hopefully to score major points by beating the timer that starts ticking down from the start. Gemstone Warrior also made great use of sound — even before seeing the monster onscreen, it could be nerve wracking just to hear certain effects. The Demons, for example, had a distinctive sound created to chill players’ blood even before their one-eyed head appeared onscreen, a technique that a number of games use to heighten the immersion…particularly those involved with survival horror. One mercy was that monsters didn’t respawn — the dead remained dead. The randomness of where loot might be found, the action of a lone hero fighting through hordes of beasts on a noble quest, and a vast dungeon were all staples of both roguelikes and typical fantasy fare like Gemstone Warrior. In a way, it can be considered an early ancestor to titles such as Diablo, Titan’s Quest, or even the 3D venues of FTL’s Dungeon Master and Westwood’s Eye of the Beholder. Unfortunately, even though its legacy can be traced on through to modern games, Gemstone Warrior and its sequel, Gemstone Healer, ended up like a lot of its peers from that decade — as abandonware. There isn’t even a remake of it out there, though the spirit of its gameplay can be felt in other games today like Runic Games’ Torchlight series. If you have an emulator for your platform of choice, you can try and find a dump of the game out there somewhere or try it at Virtual Apple’s site. It didn’t invent the concepts, but Gemstone Warrior stands out for not only embracing them but in making them work in creating a surprisingly tough, but fair, dungeon crawler. That, and for the spectacular ad and box art it used to grab the attention of would-be explorers everywhere to dive right into the dangers it promised.